The cherry trees are blooming. There is my attempt at haiku. I was inspired by the cherry trees, since they remind me of Japan, and haiku comes from Japan. I have never been to Japan, but in Grade 8 I had a substitute teacher who taught us Japanese for a week; it’s all he knew how to teach. The Japanese word for cherry tree is “sakura”. Another Japanese word I like is "sudoku". Especially when bored in class. Seriously, though, the cherry trees - they're beautiful. I saw one today and thought it was covered in snow, not blossoms. Whoops, I got Vancouver mixed up with Saskatoon. It's YOU who are all covered in snow. Fifteen more centimeters tonight. Make sure you do not forget to unplug your cars before you leave home, the cord may be covered in snow. Here, the cherry trees are blossoming. I'm not trying to rub it in, really. I walked around Jericho pond today and it took me an hour, because the red-winged blackbirds were singing and I kept having flashbacks to leading groups of grade 2s around at ecology camp and telling them the song sounded like “conkereee”. My bird book says it’s “okaleee”. Neither does it justice. I saw a common snipe for the first time. He’s currently awaiting a name. (No, Alexa, there is not enough demand currently for a 12-step program for birdaholism.) Lately I’ve been wondering if I shouldn’t just become a professional birdwatcher. I mean, a bird research and field work person. Theology sometimes excites me, but discovering a bird I’ve never seen before always makes my day. Generally (all bird songs aside), it’s too silent, as my haiku says, because I gave up listening to music for Lent. Mostly in my room – I don’t want to force my roommates to stop listening to music. I had no idea how addicted I was to music in the background, music to get me out of bed, music to distract me from homework. I do a lot more singing to myself now. I feel like a monk. I feel like Brendon. But out of all the things I’ve given up for Lent, I think it’s the best reminder. As soon as I wake up to that awful beeping (as opposed to a well-chosen CD), I remember my sacrifice and His. A couple of pictures should round this off. Here’s one of Hannah and I. Hannah is my professor’s daughter who is British and wonderful. 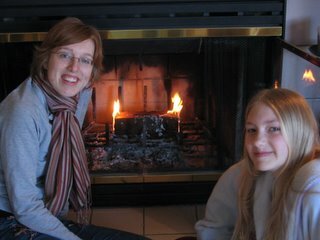 Rachel and I hung out with her one day at her house, and thought it would be quite fun to light one of those easy-light firelogs. We apparently didn’t follow the instructions well, because it looked demonic like that for quite a while. 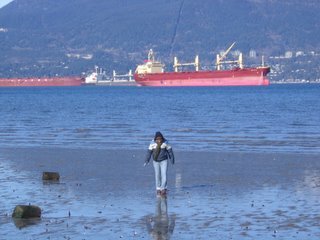 The other one is messianic Rachel, walking on the water. 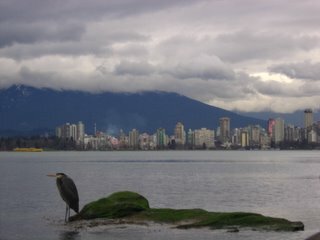 The last one I like to call “Heron City”. Martin posed quite nicely for me. P.S. Rachel and Daniel, best of luck in your One-Acts! Congratulations, Nick, on being un-deported (re-ported?) back into Canada! Congratulations, Emmanuel Baptist Gospel Choir, on an apparently smashing debut!